Deep respect for the natural world, love for his wife, but also awareness of the damage done by humans to this planet and its many creatures, and the damage we do to ourselves – this is the clear picture of David Brooks’ world view we get from his poetry. It has been seven years since the poet’s last, much-celebrated collection, The Balcony was released  and Open House is an almost seamless continuation of the conversation started in this earlier work. a decade I’d not have had otherwise. With this familiarity comes hardship, which we see in “Freight”: It begins with “[a] hot night ... So much / still left unsaid – the bed / so full of ghosts”, the couple remaining sleepless until the “slow ache of a freight train” drags away the weight of worry, and draws in the weight of sleep. We do not need to search far for Brooks’ influences because he lists them for us in “A Call for Mandelstam” where we find the writer searching his shelves with a “sudden urge for poetry” – Yeats, Pound, Clare, Lorca, Miłosz, Merwin, Bly, Wright, Adamson, and the “beloved Chinese”. Some poems, such as “Looking for a Friend in the Mountains and Not Finding Her”, actually mimic T’ang dynasty poems, the title in this case a reference to Li Po’s “Visiting the Taoist Priest Dai Tianshan But Not Finding Him”. The poem “If Anyone Asks for Me” could be a translation of another T’ang dynasty poem, proclaiming “My home is in the mountains now” and “If anyone asks for me, let someone say / ‘He is lost among clouds’.”. The influence of the Chinese and Japanese poets on Brooks is obvious, as is the work of later American poets such as Ezra Pound who translated and then built on their sensibilities. This poetry often contrasts the image of something close with something very far away, illustrating the Zen concept of all creatures being a tiny part of the universe, while at the same time, the universe being found in every tiny thing. Take for example this haiku by Issa – “Reflected in the dragonfly’s eye – mountains” . We see this also in the work of American poet James Wright, also a great influence on Brooks. Wright’s poem “By a Lake in Minnesota”, for example, begins with a description of the countryside where a “spume of light falls into valleys / Full of roses”, and then finishes back with the poet – “And downshore from the cloud, / I stand, waiting / For dark.” . 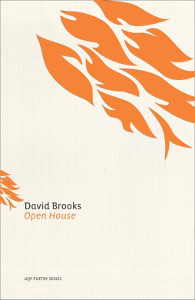 As Brooks says in a statement about his own poetry and its influences, these are poems where “in depicting the simplest scene the larger picture hovers” , and this is a foundation of Brooks’ own work. With this style, Brooks’ longer poetry bears many similarities with the work of Mark Tredinnick, who, in a recent episode of Poetica, spoke in defence of “telling” . It is an interesting method, and one that leaves the reader with a clarity of the poet’s vision, but it can be taken too far. Brooks starts “Mushroom Season” with a description of how a field of mushrooms can actually be part of the same organism connected underground. Brooks then begins his “tell” stanza with “I could have let this all pass / and written nothing, but no, life / is a mushroom season”, the mystery and wonder of the observation traded for the explanation. Perhaps the strongest poems in this collection are not the long contemplative pieces, but the shorter poems that record single moments. “The Man in the Lift” is one example, a love poem disguised as a description of an elderly man in a lift breathing in the lingering perfume of the author’s wife “as if he were a dog / reading the wind” – the man’s intoxication being the poet’s intoxication. These moments are not commented on, or explained and drawn out, but just left floating in the reader’s mind. Two similar examples are “Olives”, where the poet hears a bucket of olives tipped into a bin and thinks it is rain, and “Late Music” about hearing music from a distant party and contrasting it with the noises of the natural world. Interestingly, it is the engagement of a sense other than sight that plant the reader firmly in these moments, where the poet is present, but not overtly philosophising. Another early tendency often wrung out of poets is sentimentality, but Brooks does not shy away from that either. In The Balcony he delivered a collection of love poems, and in Open House he asks again, with everything around us and everything we go through, “how not to write of the heart?” (“At Refuge”). The poet is obviously enamoured not only with his wife, but with the natural world, having a special sympathy for animals and their plight. The poet’s dog makes several appearances, once to “lick any cracked or wounded skin as I / get up in the morning” that “helps / heal some other, more ancient hurt” (“Poem”). One of the main themes in this collection is a love of animals, but also his anger at the establishment and the meat-eating majority, and there is a thread of activism, angry activism, that runs through these poems. Where there is great love for the animal kingdom, there is often something forlorn in the poems about humanity, including one comparison of humankind to “flesh-eating Ebola” with its “huge ulcers of ... cities” (“Plentitude”). Elsewhere the feasts of Christmas with its meat dishes are compared to the Holocaust (“Silent Night”), as we “[eat] our way mindless through all the creatures of the earth” (“At the University”). Brooks’ stance is perhaps best summed up by one of the poets from Brooks’ bookshelf, M.S. Merwin: “Tonight once more / I find a single prayer and it is not for men” . These poems set the poet within the landscapes of his work, where the more hostile poems set the poet apart from the world in which he lives. The collection is also littered with simple intimacies. The poem “Morning, Station Street” does little more than list morning chores, but these poems incrementally draw us closer to the author – knowing the banality of his day is an intimacy we are granted. There is also a dryness to how this particular poem is written that suggests an adherence to a Poundian sense of sparseness, but instead of describing an image, we are given an itinerary. The poet is always present in Brooks’ poems, and even descriptions of the natural world are self-portraits as much as they are landscapes. By the end of Open House we have a good sense of the narrator – or at least the version the poet has chosen to present – his love and his anger broadcast with a very clear voice. The Dumpling Field, trans. Lucien Stryk, Swallow Press, 1991. The Branch Will Not Break, Wesleyan University Press, 1963. “Statement [Delivered at a session entitled What I Want: A Personal Poetics, Australian Poetry Festival (7th: 2010: Kings Cross, Sydney)]”, Five Bells, vol. 17, issue 4, 2010. “December Night”, from The Lice, Atheneum (New York, NY), 1969.